this is a post I have been preparing for some time now. I will show you a basic deco tutorial. 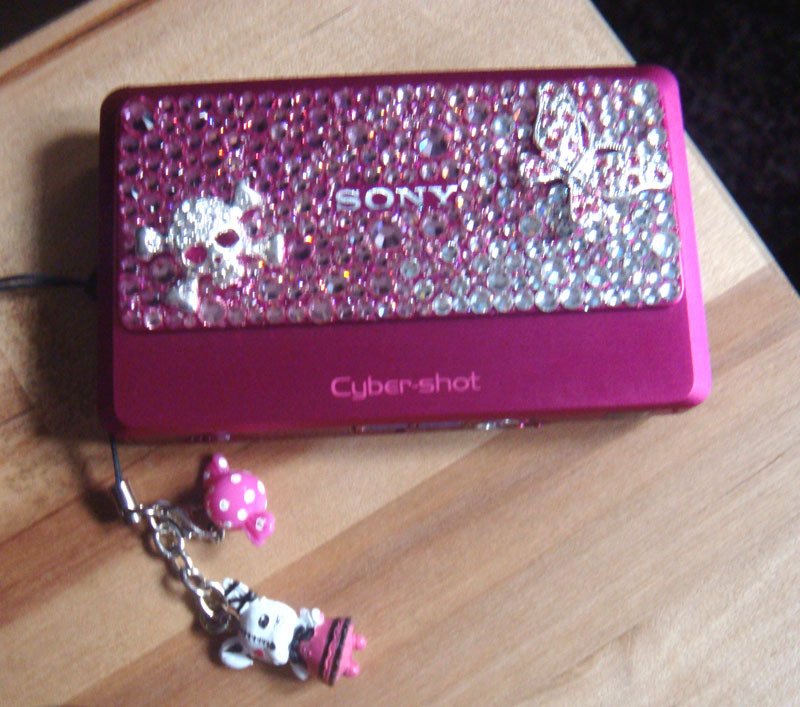 Recently I got a new camera and of course I had to bling it up. I took detailed photos of the process to show you here. First let's see what you will need. Crystals. 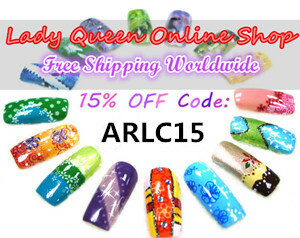 In this case I used Swarovski crystals but if you want to opt for something cheaper there are many choices like the rhinestones that we use for nail art. Deco glue. Most crafting glues will do for this. Deco parts. I used a diamante skull and a diamante butterfly. Now before you start I advise you to think carefully and decide on the design you want to make. Then place the parts roughly on the item to see how the final piece will look like. For my camera I decided to do a pink gradation design with a skull and a butterfly as accent pieces. Before anything else clear the area with some acetone. First place your accent pieces (in this case the skull and butterfly). After that you start placing the crystals. Place glue in a small area and cover it. That keeps the glue from drying and destroying your design. If at some point you place extra glue you can use a toothpick to clean it. What I find easier is to start from the edges and move inwards. 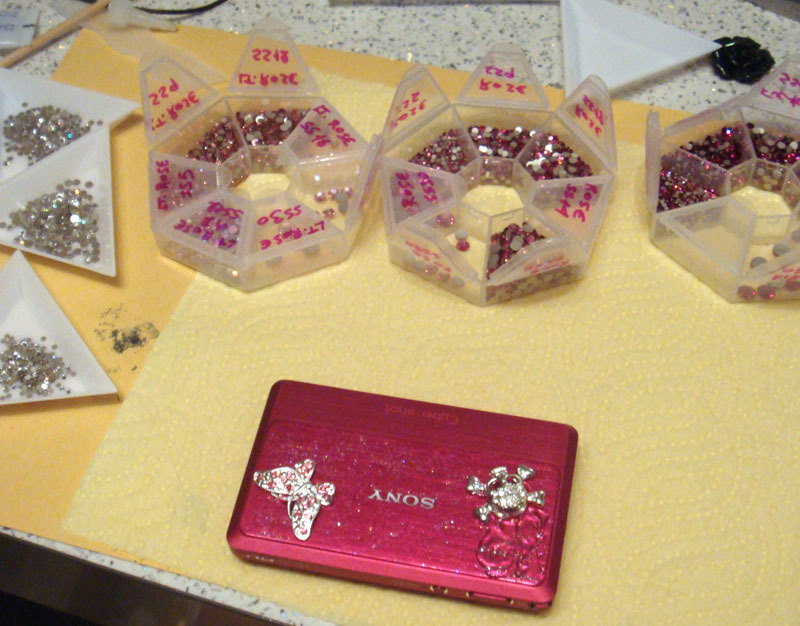 Move in a steady pace and cover all the spots using various crystal sizes. And here you go, the finished product! 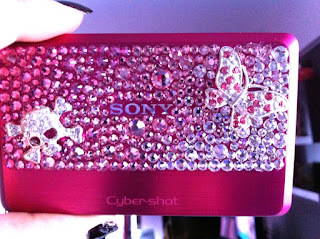 When you are done you can attach a few matching phone straps to make your item even cuter! Many of you asked where you can get deco supplies. They are very easy to find. I get some of them locally at craft stores or even 1 euro stores but you can also find them on ebay. There are many different shops there if you do a search and you can find all sorts of cute items to use. Also a word of advice. 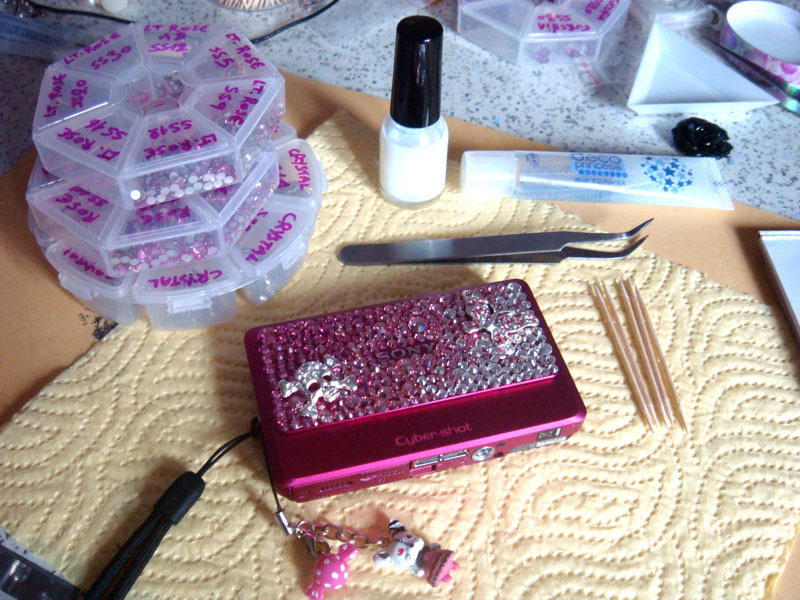 Decoden is an expensive and high maintenance hobby. 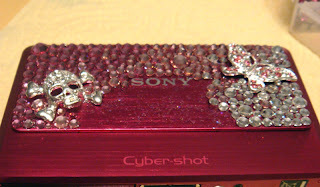 It looks very cute but there is always the chance that some of the crystals or parts will fall off, no matter how strong a glue you use. So you must handle your deco items with care and know that most probably they won't last forever. And here I will close this tutorial. If there is anything I missed or you have any questions leave a comment or shoot me an email. It might take me a while to reply as I am quite busy these days but I definitely will. Your tutorial is so clear and well explained, thanks a lot! The final product looks gorgeous and above all: unique! This looks amazing! You've inspired me to do something like this on my phone! OMG this is so cool!! 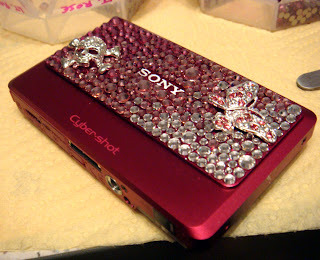 !I love it I don't have the patience to do it but this is so lovely!! This is just gorgeous! wow!